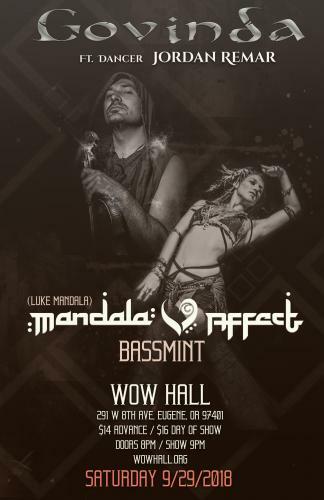 On Saturday, September 29, the Community Center for the Performing Arts and University of Oregon Campus Radio 88.1 FM KWVA proudly welcome to the WOW Hall Govinda featurig dancer Jordan Remar, The Mandala Affect and Bassmint. Govinda is the alter ego of Austin based producer/composer Shane Madden. He began studying violin and composition at the age of eight and went on to study classical violin at the University of Texas -- where he fell in love with electronic music production. It was in Madden’s pursuit of his gypsy roots that he opened his ears to music from around the world. From experiences learning violin with mysterious masters on his journeys across the globe and his passion for modern design and technology, the current sound of Govinda was born. Govinda has played with Thievery Corporation, Tipper, Bassnectar, Shpongle, Cheb I Sabbah, STS9 and many more, and been featured on over 25 compilations such as Buddha Bar II, Asian Travels II, and Nirvana Lounge selling a combined 400,000 copies. Govinda has played at numerous festivals throughout North America including Coachella, Lightning in a Bottle, Sea of Dreams, SXSW and more. Govinda’s music has been on TV including stations like WB, MTV and Bravo as well as many independent films. The Govinda show is truly a multi-sensory experience that immerses the audience with a textured exotic atmosphere which features mesmerizing vocals, visual performance artist Jordan Remar, live projections, live gypsy violin for a truly energetic and magical live presence. Luke’s story is one of community, passion and following your heart. When the deep house/techno community of the Sacramento/bay area captured his heart in the late 90’s, Luke basically moved to where he found his favorite dance communities ever since. The healing power of dance is a major theme in Luke’s life and always will be, it has shaped who he is since he was 14. After some amazing experiences opening his heart and mind with the dance music scene in the Northwest USA, he had to move down to San Diego to finish high school. In San Diego, Luke continued to learn to mix house/techno vinyl, mostly on his own due to the fact that he didn’t know anyone else who knew what house music was during those high school years! Greatly missing the dance scenes that inspired him in the NW, Luke moved back north to be involved with the Sacramento/Bay Area scene shortly after finishing high school. It was then that he started throwing small outdoor progressive/minded dance events in the woods with an emphasis on unity, community and kindness. Around 2004 Luke moved to Humboldt, CA after he was inspired by Deep Groove Society, a crew that was doing some epic outdoor events out in nature around that region. Luke didn’t stay long because shortly after moving to Humboldt, Niko Mantele booked him to play some music at an underground warehouse party in Portland and then he never left (in large part because Luke fell for this girl in Portland). After living in PDX for 1.5 years and throwing some outdoor events in the region, Luke moved to Eugene around 2005 because Tim Greathouse offered Luke a room in the back of his martial arts/yoga warehouse rent-free so Luke could focus on learning to make music instead of having to work a normal job so often. From 2005-2009 Luke was frequently throwing dance parties in warehouses and lofts and also ran a big TurboSound sound system; Vortex Sound. Luke also had a 40-foot greyhound bus that ran on veggie oil that stored and transported the sound system to events around the West U.S. As a young DJ, Luke was also playing large events in 2005-2009 such as Zuvuya III festival in Mexico, legendary Oracle Gatherings (Seattle), Guatemala, Mexico, Fire Festival (Portland, OR). From 2009 onward Luke has been touring around the world with DJ/Live sets performing at big events such as Symbioses Global Eclipse, Beloved Festival (OR), Serenity Gathering (CA), Photosynthesis/Cascadia Festivals (WA), Chinese New Year (SF), Inspire Truth New Years (PDX), Decibel Festivals, and many amazing Moontribe events over the years. In 2008 Luke started releasing house/techno/downtempo and has been releasing 30-50 tracks/year ever since. In 2010 Luke’s remix of Booka Shade’s “Regenerate” was released with Booka Shade Music and was on Anthony Pappa’s cover-mount DJ mix of DJ Mag. To the present day, Luke has never taken any big break from making music; for the last 10 years there has been a consistent flow of music with many of the biggest DJ’s in the world playing Luke’s music -- such as Nick Warren, Boris Brejcha, Desert Dwellers, Dave Seaman, Kaya Project, and Eelke Klein. Official remixes have been with huge artists like Desert Dwellers​, Bluetech​, Evan Marc​, Christian Martin​, Chloe Harris, Adham Shaikh, Kaminanda​, Govinda, Roger Martinez, and Deya Dova​. In 2010 Luke started making downtempo/psybass. First he released a few EP’s with Addictech records and Desert Dwellers’ label Desert Trax, then later with Kalya Scintilla​’s label Merkaba Music, the massive Gravitas Recordings, Black Swan and Luke’s own label Activated Recordings​. Now at the age of 33, the healing power of dance is deeply weaved with Luke’s soul because he has been DJing consistently since the age of 14 when he was developing his identity in life. The compassion, community and unity in these dance scenes, as well as the friends Luke has made from it, have been his family in many ways for his whole adult life because his blood family lived far away in other states. Tickets are $14 in advance, $16 day of show. Doors open at 8:00 pm and showtime is 9:00.